How Does a Hydraulic Scissor Lift Table Work? 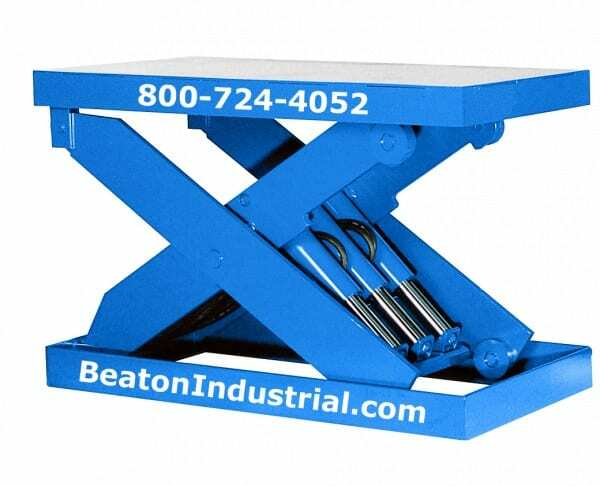 | Beaton Industrial, Inc.
Home/Uncategorized/How Does a Hydraulic Scissor Lift Table Work? How Does a Hydraulic Scissor Lift Table Work? The hydraulic scissor lift table is one of the most commonly used pieces of industrial equipment. Found in factories all over the world, hydraulic lift tables are simple to use, and provide ergonomic benefits to the operator. The scissor lift table design can be broken down into 5 parts. Platform – The products being lifted will rest on the top of the table, commonly refereed to as the platform. 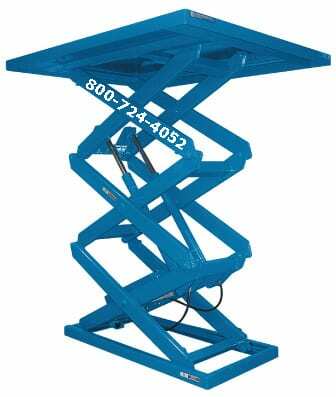 The American lift tables we sell typically use 1/4″ steel for the scissor lift table platform. Hydraulic scissor lift table platforms are offered in a variety of sizes and dimensions. Base – The base of the table is comprised of very rigid angle iron. Besides being the foundation for the unit, the base is engineered with tracks to guide the rollers at the bottom of the scissor legs. Bases have a minimum size they must adhere to, and are contingent upon the size of the platform, the capacity, the amount of travel, and how the unit is being loaded and unloaded. Scissor Legs – Bridging the gap between the base and the platform are the vertical scissor legs. The legs are responsible for guiding the platform through different elevation changes. 4. Hydraulic Cylinders – The raising and lowering of the unit is actuated by high pressure hydraulic cylinders. On the average hydraulic scissor lift table, the number of cylinders will typically vary from 1 to as many as 4 cylinders. 5. Motor / Power Pack / Power Source – Hydraulic lift tables are commonly powered by an electric motor. They can also be powered pneumatically via a high pressure industrial air compressor. 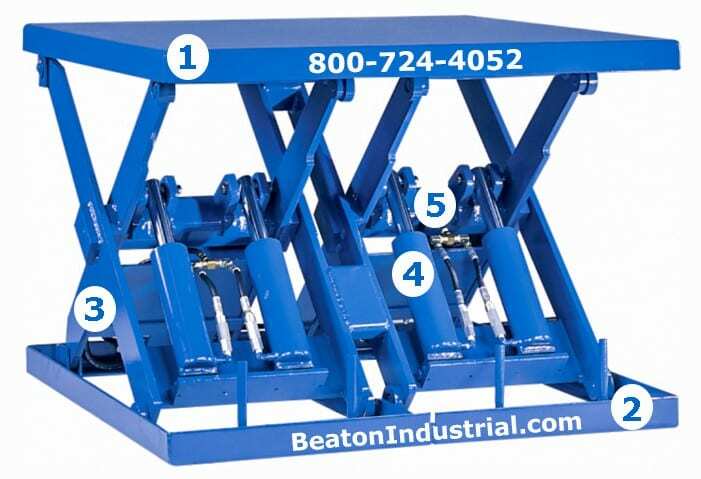 Many lift tables will have a self contained motor such as the unit above (motor is located behind cylinders on reverse side). Some lifts will require a remote power pack that is located off to the side of the unit. The hydraulic lift table raises as the motor pushes oil into the ram cylinder. After raising the unit and the motor has stopped, the oil stays in the hydraulic cylinder and the lift stays in the raised position thanks to a simple check valve. The speed at which the lift table will raise under a full load is contingent upon a few different variables. Tables with higher capacities and travel will generally rise slower than light capacity short travel lifts. Another component to consider is the motor horsepower. To increase speed, one may want to order a unit with a higher horsepower. However keep in mind, more horsepower is not always better and in fact can be detrimental to the structure. Using a 3HP motor instead of a 2HP motor could be enough to wear out the structure of the lift table 2 or 3 times faster than if the 2HP motor was used. The difference is a hard start vs. a soft start. Whats a “start” you might ask? A start is anytime someone pushes the up button and the motor engages to raise the platform. The structure of the lift table experiences the greatest stress at the start. Bumping the motor up to a unnecessary 3HP increases the amount stress the structure will encounter that much more than the appropriate 2HP motor. Lastly, one of the most overlooked factors that determine lift speed is the voltage. A 230 or 460 volt 3-phase motor will generally raise the lift twice as fast as a 110-115 volt 1-phase motor. The hydraulic lift table is lowered by a solenoid opening the down valve via the down switch on the pendant control. The down valve’s standard position is closed to ensure the platform doesn’t accidentally lower in the event of a power outage. When the down button is pressed on the pendant control, the solenoid triggers the valve to open, thereby allowing the hydraulic oil to return the oil reservoir. The speed at which the platform lowers is dependent upon the preset opening size of the flow control valve. The Flow Control (FC) valve is pressure compensated and set to regulate fluid flow at predetermined rate whether the lift is empty or loaded. In most cases, the Flow Control valve is set to match the lift table’s upward speed. If you have any questions about scissor lifts, or how to apply one to your current operation, please contact Jon at 800-724-4052 x101.